EDAC clients, Growing Home and Green Exchange, were among the organizations recognized at the 19th Annual Chicago Neighborhood Development Awards. 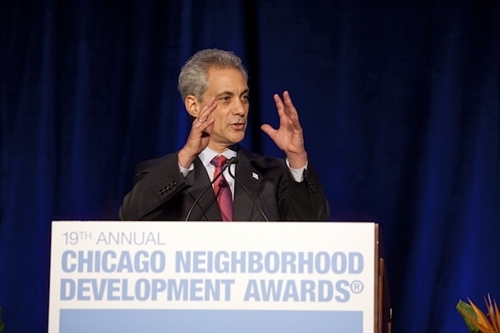 In his introductory statement, keynote speaker and Mayor of Chicago, Rahm Emanuel, noted the importance of the work being done by these groups- listing “…urban farming that addresses the need for access to quality food while cultivating community…” and “…the transformation of blighted blocks…” among the diverse accomplishments of awardees. Rahm Emanuel at 19th Annual Chicago Neighborhood Development Awards. Established in 1995, the Chicago Neighborhood Development Awards (CNDA) recognize the essential role that both non-profit and for-profit developers play in building communities in Chicago-area neighborhoods. The CNDA Awards recognize outstanding achievement in neighborhood real estate development and community building, especially the achievements of community development corporations (CDCs), other community-based organizations and for-profit developers working to build healthier neighborhoods in the Chicago metropolitan area. EDAC wishes to express its appreciation to LISC Chicago (with kudos to Communications Manager, Gordon Walek and Executive Director, Susana Vasquez) for providing access to the videos of our clients’ projects (see Growing Home and Green Exchange CNDA posts) and for supporting our work with the programs developed by Growing Home and Green Exchange in collaboration with North Branch Works (formerly LEED).